My kids have had some pretty ugly looking bug bites throughout the summer, but usually they heal themselves up just fine on their own. 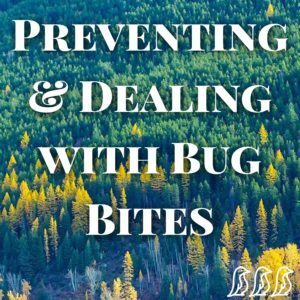 Below we touch on common bug bites to be aware of & how to prevent them. It is important to read the labels of the bug repellents that you’re buying! According to Consumer Reports, “Products with any one of these active ingredients – deet, oil of lemon eucalyptus, & picaridin – worked well in our tests. And all are safe, even for pregnant women, when used appropriately.” They also make note that you should be wary of “natural” repellents because their claims didn’t always match the findings of Consumer Reports research. Some ticks are so tiny that you might not notice them until you start displaying symptoms. Try to make checking for ticks a nightly routine so that you can spot them before they cause too many problems. Some symptoms of tickborne diseases can include a rash or red spot near the site of the bite, a rash all over the body, stiff neck, headaches, nausea, achiness or joint pain, fevers, & fatigue. The CDC has some great information regarding ticks here. Spider bites (while icky) are quite common, but there are poisonous spider bites that can be serious. The majority of spider bites leave behind small, itchy spots that heal on their own, but if you are concerned that you may have been bitten by something more concerning you can go to this Healthline site to identify what may have bit you. Mosquitoes can transmit diseases like Malaria, Yellow Fever, West Nile Virus, Dengue Fever, and other viruses. Luckily Malaria & other mosquito transmitted diseases are rare, but it is best to avoid mosquito bites as much as possible (even if it’s to avoid the itchy bumps). Stagnant water (like bird baths, kiddie pools, or puddles) can increase mosquitoes so empty anything you can. There are certain types of plants that help to repel mosquitoes, & you can always light citronella candles around the area as well.